We rarely go out to eat, but when we do we’re picky. In my opinion, the number one reason to go out to eat is to order something that you can’t do as well at home. Pizza was my favorite example. I don’t have a wood fired oven, pizza peels drive me crazy (my pizza dough always seems to stick while I’m trying to get it on the pizza stone), and my crust never gets as crisp as I would like it. 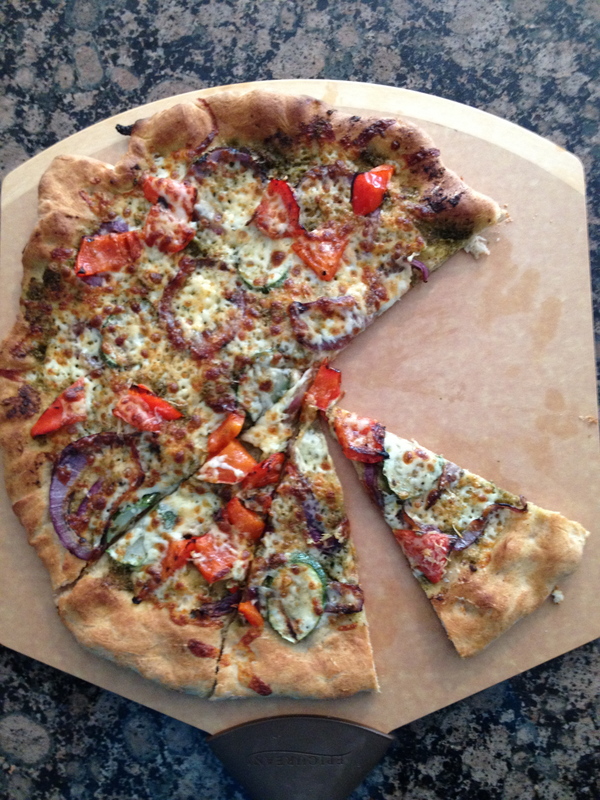 Pizza at home is just not as good. Or it wasn’t. I’ve experimented over the past couple of months. I’ve let dough rise overnight, for several hours, and for no time at all. I’ve messed with the heat and cooked pizzas at 450 degrees, 550 degrees, and finally just under the broiler. I’ve grilled pizzas on the grill and baked them on a stone. I’ve preheated that stone from 30 minutes to more than 1 hour. In short, I’ve made and eaten a lot of pizza and I think I’ve found one I like. I’ve included the recipe at the end of this post, but to truly get praiseworthy results read on for some tips to making a great pie in your home. 1. Preheat the oven. Lots of recipes tell you to place the stone in your oven and preheat it for at least an hour. Most of us ignore this advice thinking that 20 or 30 minutes will suffice. We are wrong. Preheating the oven requires some advanced planning and makes your kitchen quite hot, but it’s important. For the crispest crust, that stone needs to be as hot as possible. Plan ahead. Preheat the stone on a rack in the TOP third of your oven for at least 1 hour. 2. Make your own dough. Store-bought dough is easy, but that doesn’t make it good. While using regular yeast and allowing the dough to rise yields a more interesting dough with a little more depth of flavor, use pizza crust yeast to make your own dough in less than 5 minutes. Pizza crust yeast is found in the baking aisle next to the Active Dry and Rapid Rise yeast. It does NOT need to rise. This means that you can make your own dough in far less time than it takes to buy it. 3. Flour or foil. Pizza peels make me want to scream. If using a pizza peel, be sure to dust it generously with flour, cornmeal or semolina flour to prevent the pizza from sticking. If you are still struggling to get the pizza into the oven, roll the dough out on a piece of non-stick aluminum foil. My mother-in-law introduced me to the stuff and it works wonders. You simply slide the foil with the pizza on top into the oven. The pizza easily comes off the foil when it’s ready and the foil can then be re-used or recycled. While cooking on non-stick foil in the oven is optional, it’s a must for me on the grill. You still get great grill marks and clean-up is a breeze. 4. High (really high) heat. My pizzas were good, but they weren’t great until I read an article about pizza in the March 2012 issue of Bon Appetit. The article recommends preheating the oven and your pizza stone at the highest temperature possible for your oven. For me that’s 550 degrees. When you slide your pizza on the stone, turn your broiler on. It only takes 6-7 minutes from there. The top of your pizza will be brown and bubbly while your crust, provided you properly preheated your stone, will be nice and crisp. On a side note, for those that want to experiment with a longer rising dough, Jim Lahey’s recipe for No Knead Pizza Dough featured in the same article is exceptional. 5. Exercise restraint. I too want to pile as many toppings on my pie as possible, but it never yields the best results. A friend of mine (you can read her blog here), who clearly knows how to edit herself, demonstrated this technique beautifully when she and her husband came over for pizza. Her pizza looked pathetic going into the oven (I had to hold myself back from throwing some mushrooms on it), but when it came out it stole the show. It was a pizza trifecta: crispy crust, nicely browned cheese, and good topping ratio. It was awesome. I’ve tried to channel her minimalism with mixed results ever since. And with those five tips, I’ll leave you with the recipe. May you never order pizza again. 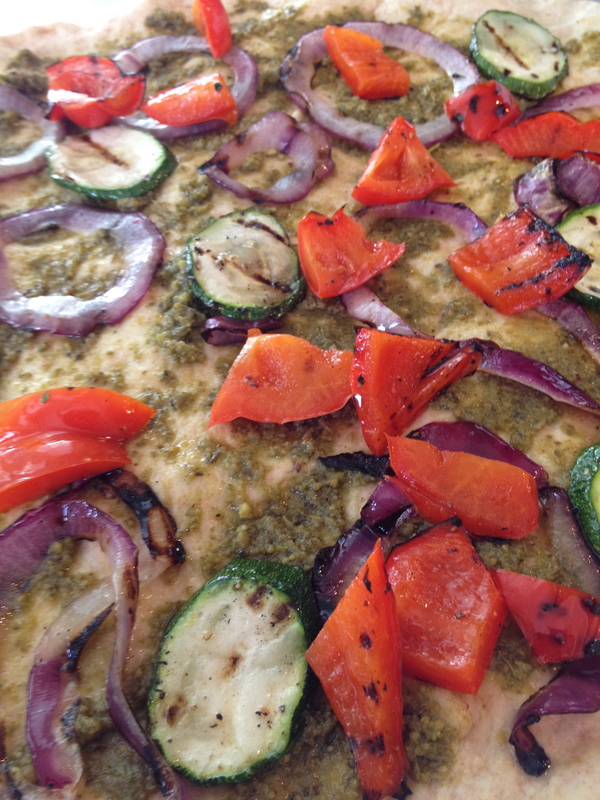 This delicious pizza is a perfect way to use up grilled vegetables from an earlier meal. While the homemade basil pesto is to ridiculously good, for those in a rush substitute a little store-bought pesto for a time-saving solution. Place a pizza stone in the top third of the oven and preheat the oven as high as it will go (usually 500 to 550 degrees). Heat a grill or grill pan over medium-high heat. 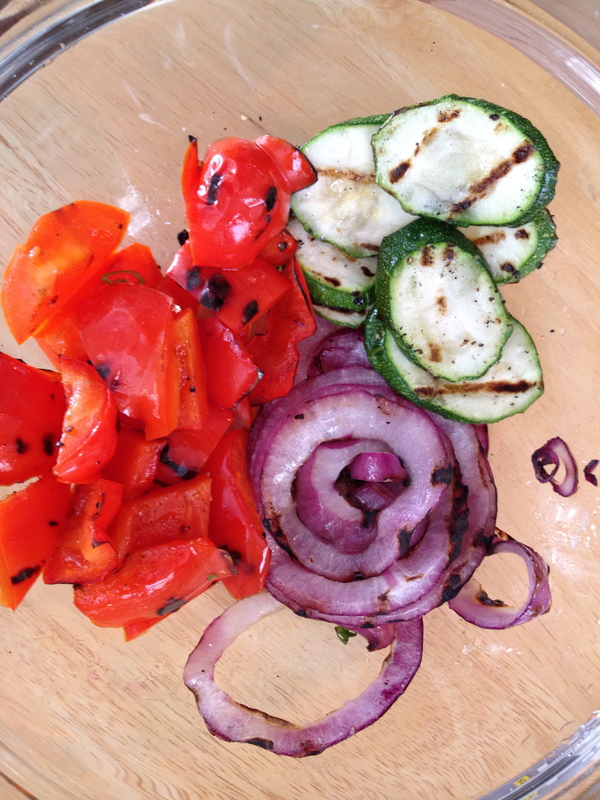 Toss the vegetables with just enough olive oil to coat and season to taste with salt and freshly ground black pepper. Grill the vegetables until grill marks appear. Cut the grilled red pepper wedges into smaller pieces. To make the pesto, combine the basil, garlic, pine nuts, Parmesan cheese, and olive oil in a blender. Process until almost completely smooth and season to taste with salt and freshly ground black pepper. Set aside. In a small bowl, whisk together the pizza yeast, the warm water, and the olive oil. Set aside. In a large bowl, whisk together the bread flour, the whole wheat flour, and salt. Pour the liquid ingredients into the dry ingredients and stir until combined. 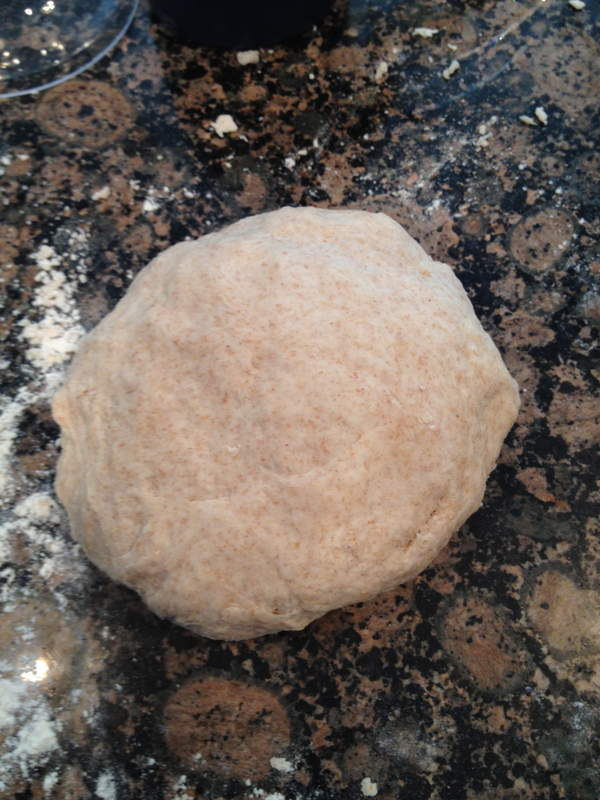 Turn the dough out on a well-floured counter and knead for about 5 minutes until the dough is smooth and pliable. 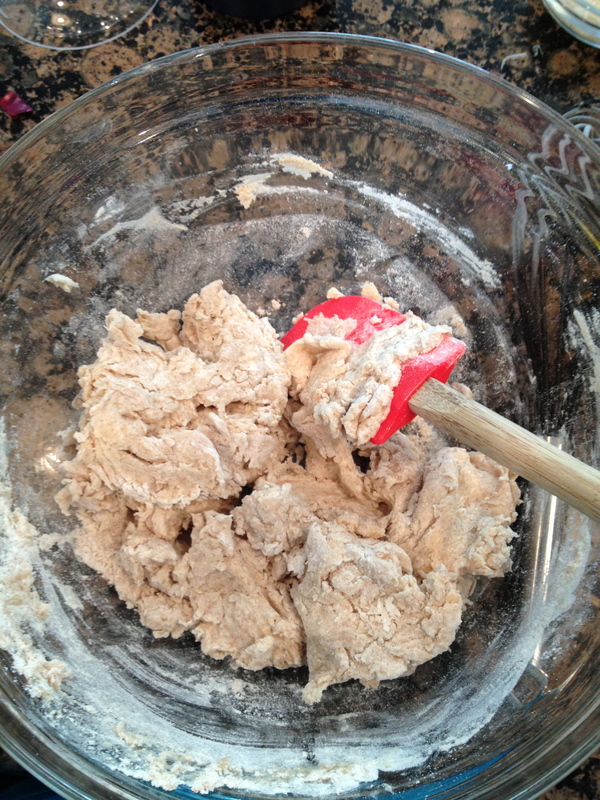 Add more flour if the dough is too wet and add a little water if the dough is too dry. Once the dough is smooth, use your hands to gently toss the dough into a round (or use a rolling pin) and place on non-stick aluminum foil or a generously floured pizza peel. Brush the dough with olive oil. Spread about ¼ cup of the pesto (the remaining pesto can be covered with plastic wrap and stored in the fridge for up to one week) over the pizza. Top with the grilled vegetables. Sprinkle the mozzarella and Parmesan over the pizza. Turn the oven on broil. 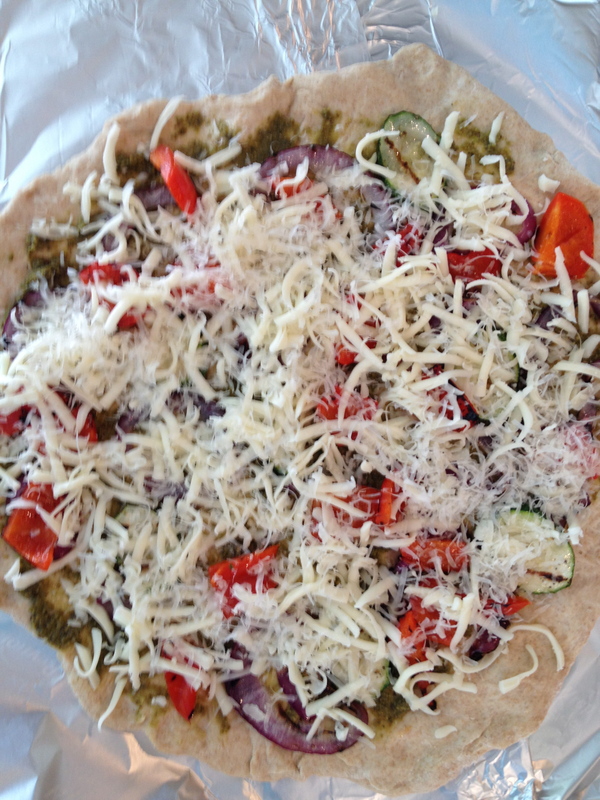 Slide the pizza onto the preheated stone using a peel and bake for 5-7 minutes until the cheese is bubbly and brown. Remove the pizza from the oven and drizzle with a little olive oil, if desired. Enjoy. Thanks for taking the time to comment and for offering such great suggestions for preventing the dough from sticking. I find that most people can’t move quick enough to keep the dough from sticking and that the non-stick aluminum foil reduces some of the stress for first-timers. For an ultra-crispy crust, I’ve started removing the non-stick foil about 2 minutes into the cooking time. 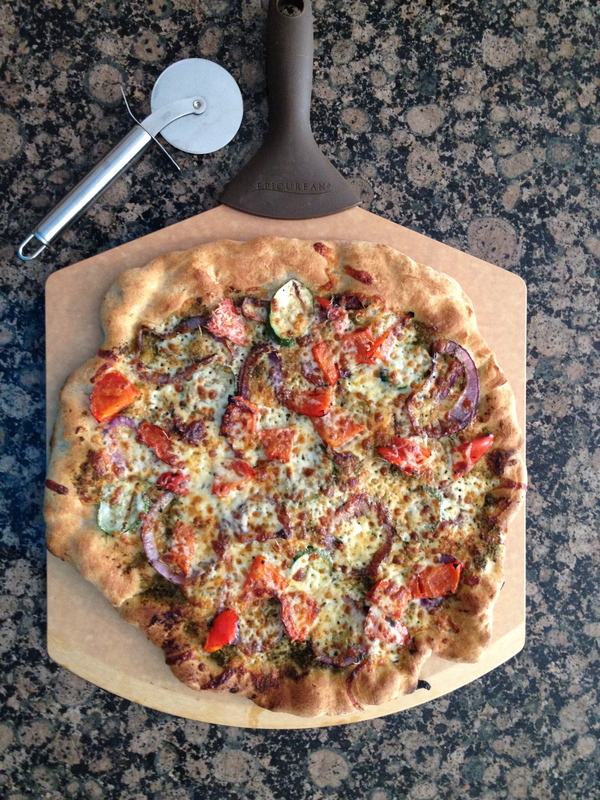 It slides out easily and allows the pizza to crisp up on the stone. It yields really good results. Thanks for reading and happy cooking!